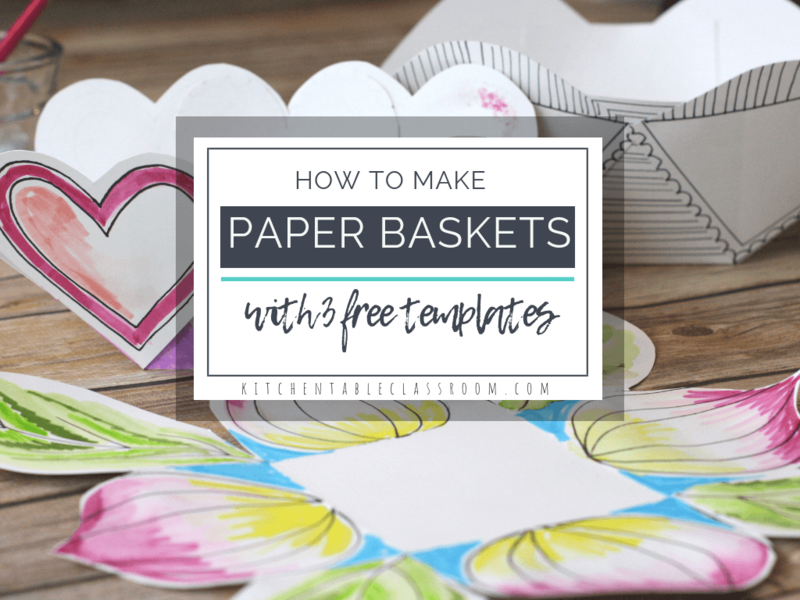 Each of these paper baskets starts with a free printable blank template. The template each print on standard 8.5 x 11 paper for easy printing. I suggest printing on cardstock as it will make for a sturdier basket, but as always, use what you have! Our baskets were printed on white so we could add our own color and design. But printing on colored card stock would make for a simple, colorful basket too! Although each template is a blank outline there are three different shapes. One basket has heart shaped flaps, one geometric, and the other organic shapes perfect for flowers and leaves. Print your template of choice out. Cut it out now. The portion of the basket that shows the most is actually the outside. After cutting on the lines, fold the basket on the dotted lines so it’s evident where each section of the basket begins and ends. Now flip the basket over and make your designs on the back. If you kiddos made ten of these paper baskets I’m guessing they’d all turn out different. Different shapes suggest different designs for each of the three templates but they are blank…on purpose! That way your kiddos can use their imagination as far as what should fill the blank space. If your paper baskets are printed on cardstock your baskets will be sturdy enough to handle about any medium your kids choose! The baskets pictured started with permanent black Sharpie marker. Then we used washable marker on top with a dash of water added to liquify the marker a bit to look like watercolor paints. This directed flower drawing uses and explains this paint with markers technique more fully! Add a handle to your paper basket…. While a handle isn’t included in the templates for these paper baskets it’s a super simple addition. A strip of cardstock, decorated to match, can be attached to either side of the basket with glue or a stapler. So sweet, and the perfect way to deliver a small gift! 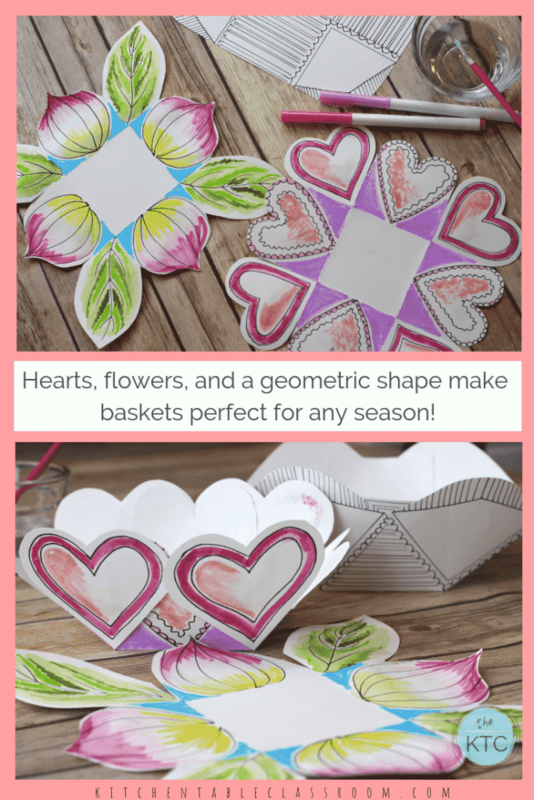 If your little people enjoyed this paper basket project be sure to check out these small woven paper baskets. 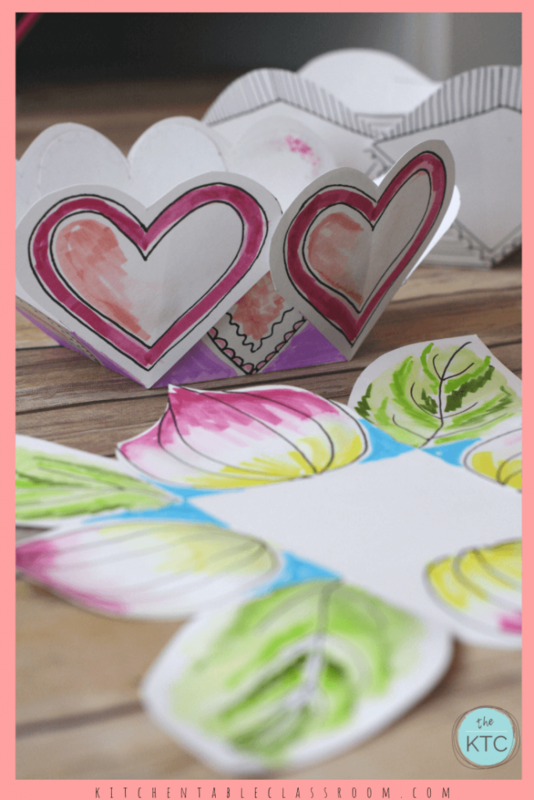 They also start with a template and are the perfect way to upcycle some old children’s artwork into a colorful new project! 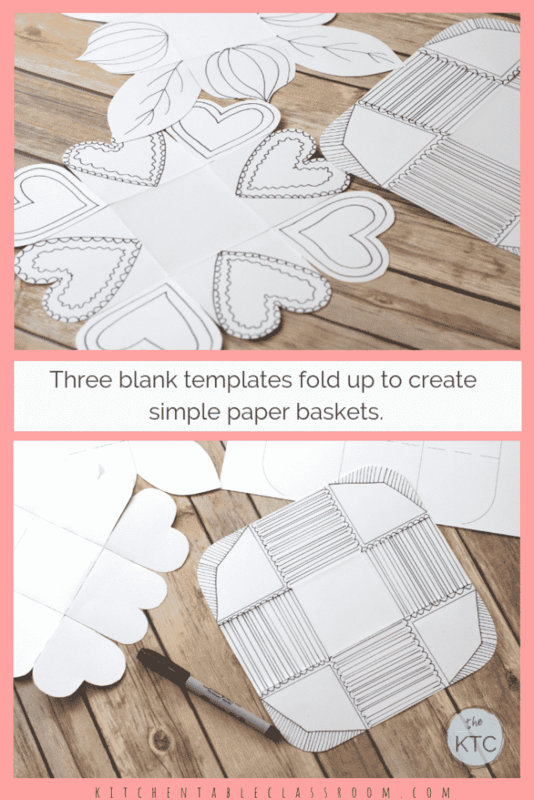 Want to grab the three paper basket templates…. If you’d like to get three paper basket templates in easy to print PDF form just use the subscribe form below. After you subscribe go check your email and confirm that you meant to subscribe. You’ll then receive a subscriber only password that will give you access to my Free Resource Library. 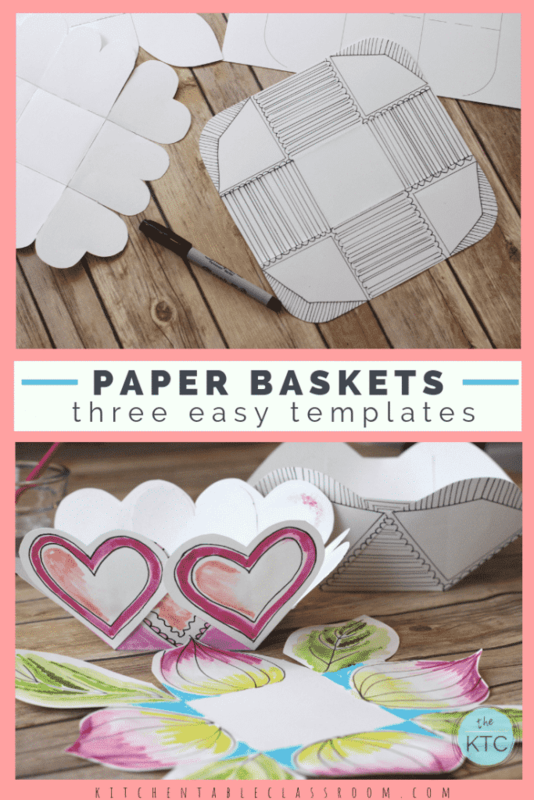 There you’ll find these paper basket templates as well as over one hundred other free printable resources, all in PDF form. Click any thumbnail in the gallery and all of the printables in that set will pop as part of the PDF! Already a Kitchen Table Classroom subscriber…. If you loved learning how to make a paper basket please share this post! Every single share helps me to grow and bring you more fun and creative ideas! These are simply adorable and so simple to make and when we made them from cardstock we put the girls trinkets in them. I used them on tables for my annual Ladies Tea. That’s great Dana! Thanks for sharing!